How special the relationship is between a father and his daughter is rarely on display more than at a wedding. His daughter has been visualizing her wedding day for most of her life. Likewise her father has been thinking about the day he will finally get the honor of walking his baby girl down the aisle in front of those dear to them. Men can be hard nuts to crack emotionally, often bottling up their feelings to protect their appearance. Nothing can soften up a dad more than seeing his daughter in her wedding dress for the first time. I love capturing any tears that follow, as it's a beautiful reminder of the journey that has got them to this point. As a father of my own daughter, I think about how special this will be, and hope to be lucky enough to experience this as well. 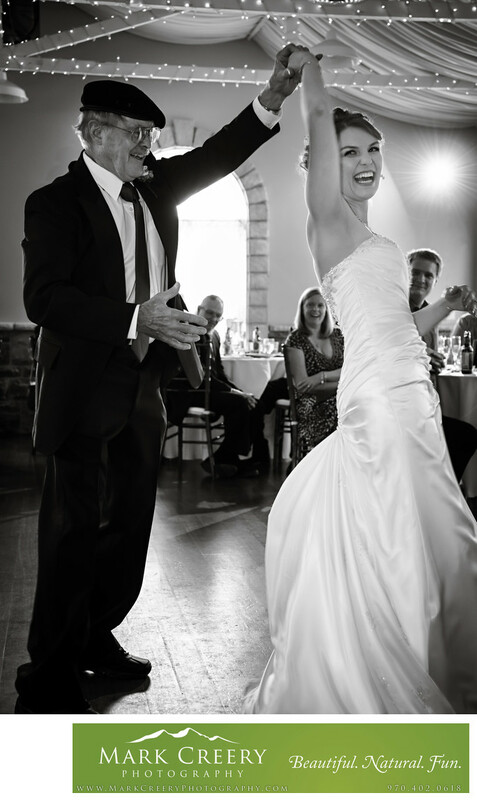 In this wedding reception photograph taken at the Tapestry House of the Father Daughter dance, the proud father is spinning her girl around. He wasn't the smoothest dancer, but it doesn't matter. It's all about the love and joy being able to experience this day finally. I love that you can see the expressions of both of them well as they laugh. The Tapestry House is located in Laporte, Colorado. Contact: (970) 237-6369, events@wedgewoodbanquet.com.